no unfortunately not, because it wont detect anything at all, so cant adjust your ignition at idle. pull them out and inspect, mine was in two pieces. I thought the knock sensor just advanced the timing (or retarded, whichever) when 95 was in. So if it's not working it won't do anything to the timing????? It's only an on/off type sensor and doesn't give variable readings, does it not? Faulty knock sensor would show up an error code - if there is no code it's unlikely to be that TBH. All I've done since it was running poo all day yesterday was wash the car and shove a bottle of redex injection cleaner in. still worth an inspection in my eyes mate. Your engine will run rough regardless of what fuel you put in if the knock sensors aren't working. How do you inspect them? They're a Quartz type vibration sensor aren't they? "The knock sensors (purple arrow) have remained in the same locations. There is one installed on both the left and right side of the engine block. 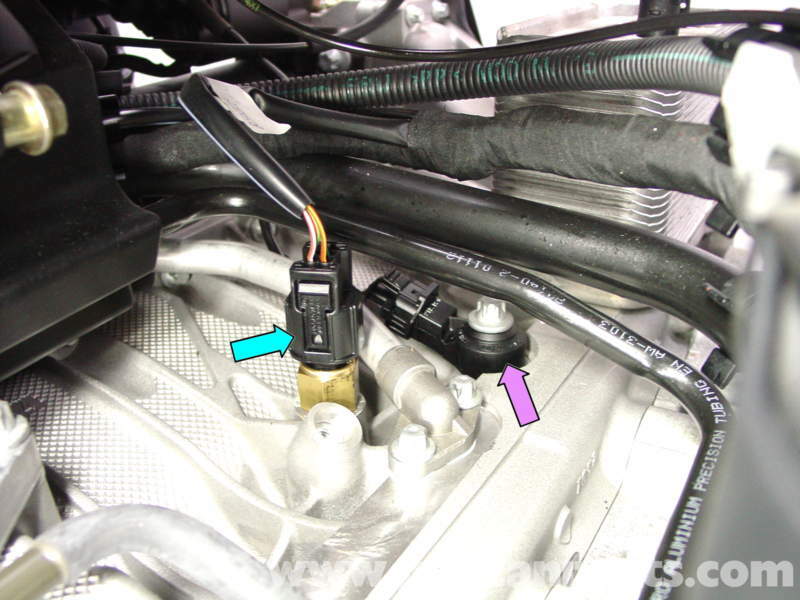 Located under the intake manifold, both of these sensors are relatively difficult to get to (you need to remove the intake tubes to access them)"
Failing swapping the 02 sensors over and taking readings to rule them out you mentioned cleaning and checking the intake, did that include anything downstream of the throttle body? Did you remove (at any time) the intake tube assemblies or intake manifolds? One of the 6 rubber boots from the plastic intake runners could be leaking air and there's quite a few seals in those joints too. Stripped top end back to rubber gaitors between plenum and manifolds, everything checked out ok. I am tempted to get a smoke machine pumped through it when I get back off hols if still doing it. Removing filler cap does alter engine revs and there is vac present, but only low and not to the point that it's hard to get the cap off. I did take the connector off the throttle body yesterday that the pipe locks on to at the top left (breather/vac pipe) and with the engine running there was a light smoky/oily vapour coming from it. Car had it's oil changed (mobil 1) back in April and since then and a few thousand miles, the level on the dip has dropped about 1mm tops so it's not like it's using oil. The confusing thing though is the fault is intermittent. I've been to the chippy for lunch today and the cars running great, same last night going to the boozer. If it's intermittent, wouldn't that rule out: vac leak, AOS, blocked injector, dodgy coil pack/spark plug, sticky tappet, stuck varicam solenoid and any other mechanical issue?????? I had it fully up to temp with oil pressure just under 1 bar the other day, ragged all over the place, still ran fine. Last night gave it some when fully up to temp and still fine. You can tell now within a 2 minute drive from cold whether it's right or not just by giving it a rev and watching what happens when it drops. Good - drops straight down to 1k then slowly down to tickover. Bad - straight down to about 400rpm, nearly conk out then up to tickover and vary. Not saying too much yet until I'm confident the lumpy tickover has been resolved. Car feels totally different though after 1st couple of rides. Will update in the next day or so. would it not be better to get some rent $$ out and go to a decent garage to get checked over properly in case its doing more damage. I just could not live with that for 13 months. Yeah!! Although for a long time, the fault was intermittent which made it more difficult to diagnose, but at the same time ruled out (IMHO) most non electronic issues. Still not 100% convinced I've sorted and also not 100% convinced I know how I sorted it but will probably report back tonight after I've driven it a couple more times. Would've been an option if I wasn't currently living below the rent line, although I did take it to a garage within that period (last year) and no codes were showing on the ECU. Read the codes since and nothing showing. If the ECU is controlling the running of the engine within the programmed parameters, then nothing will show, even though this may show slight idle issues. Most members wouldn't even have noticed it, especially if they're the ones who constantly running their HVAC on 'Auto' as it shifts the revs up on tickover (due to running the compressor). My car had some of the symptoms yours had, albeit not the same degree of rev fluctuations, but it had a lumpy idle when warm. Durametric did not highlight any errors, but after checking the car thoroughly my Indy suspected it was lambda related and recommended changing them. Based on this I changed both lambas as part of my exhaust swap and I'm fairly certain it has resolved the issue as the idle is now stable whatever the operating temperature. Out of interest mate, have you checked what voltage is showing when it runs like crap? I noticed a few weeks back, I had been on a long journey, stuck in traffic a lot and with two phones charging from the car. Battery dropped down to like 13.5 while running and I started getting some idle issues like you describe. Unplugged the two phones draw and it went away? Been an interesting read spanning you over the course of a year Alex. Do you now have a sweet running car? Itching to know what the problem was in the end. I had a similar situation on my race car a few years back, sadly it cant be related as I think that was a vac leak. so a mechanical issue which cant be scanned.